You are here: Home / Investing / Betterment Gift Registry – Is It For You? For those who haven’t read my Betterment review, Betterment offer easy investment solutions for those looking into passive investing. Now they released a new option this week that can be a great help for those looking at giving a practical gift that can build in value – Betterment Gifts. With loved ones celebrating life events like marriages and births, having a gift registry can be incredibly helpful for both the recipients and the givers. When we were planning our wedding, we worked hard at creating a registry that only had these we planned on using many times. No one wants to give or get a gift that’s not needed or wanted. It was smaller than the typical registry, but givers knew that if they bought something off the list, we’d truly use it as we settled into our first apartment together. Besides guifts, we were also grateful to receive cash and checks as gifts. Instead of splurging that money, we instead used it for savings, including as seed money for our house down payment. When I heard about Betterment’s new service I thought of how helpful it would be for couples and families to use for long term goals. I asked for more information. I wanted to see how hard or easy it was for customers to create and give on their site. 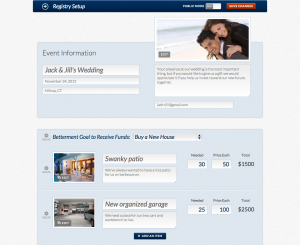 The good news is that Betterment makes it simple to create a registry for your special event. You can now give the details of the event. Please enter an event name, date, description, and location. Add your investing goal and select which account you want the gifts contributed towards. Go ahead and save your registry and make it public. Giving a gift through Betterment is even easier. You simply need a credit or debit card and the money is contributed towards the recipient’s goal. Betterment doesn’t charge a transaction or credit card fee for your deposit. I’d really like to hear from you. For those getting ready for a big life event like getting married or having a baby, what are your plans? Are you going to have a gift registry? What are you planning on including in it?